The Zooka ZS740 Pitching Machine uses compressed air to accurately and consistently pitch up to 700 baseballs per charge. 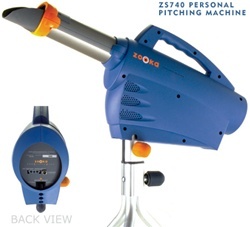 The Zooka ZS740 is battery powered and weighs under 30 lbs making it a truly portable pitching machine. 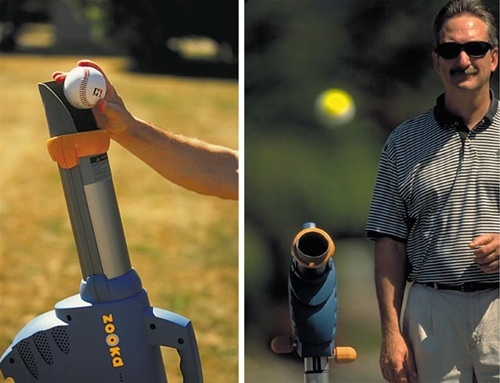 Zooka ZS740 pitching machines can pitch any kind of baseball, pitching machine ball or tennis ball at speeds up to 70mph from distances as far as 60 feet. The Zooka ZS740 is the only real ball pitching machine using an internal battery that will throw real balls this fast...up to 70mph!! The digital control panel allows you to easily control the speed setting or even pre-program a practice with multiple speeds and pitch locations. It's light weight and simple design allows this pitching machine to be set-up or taken down in less than a minute without tools, and it's great for defensive fielding and pop fly practices. The rechargable battery for the ZS740 Baseball Pitching Machine allows 700+ pitches at 40 mph, 500+ pitches at 50 mph and 400+ pitches at 70 mph. The optional external battery doubles the number of pitches. A battery charger is included with a recharge time of 80% charged in 5 hours and totally charged overnight. The typical battery life is 5 to 10 years with normal use. It works by putting a baseball into the barrel. The ball is detected and the compressor pumps up, and then shoots an internal cup propelling the ball. Depending on pitch speed and battery charge the ZS740 can pitch a baseball every 2 to 7 seconds. Its safety features include a password protected start-up and a one button shut down. Pitch alert beeper and LED. The ZS740 comes standard with a tall panning tripod which has a full 360 degree pan and a 43 inch pitch release height suitable for older players. FAST: 10-70mph Pitches, throws pop-ups over 12 stories high, random change-ups too! Throws real baseballs up to 70 mph. Also throws dimple balls, tennis balls, and most safety balls (baseball size wiffle balls and lite balls). Adjustable speed: 10 to 70 mph. I have used this machine several times before when some of my assistant coaches had them. Now that I own one myself, I can highly recommend this for any coach. This thing can consistently throw fly balls very high into the air for practice, it can definitely be used for hitting practice (~ 70 Mph), and is great for catcher practice. The battery last way longer than expected (close to 300 balls at 70MPH). --Word of advice though, open the unit up as if you are changing out the battery as the leads going to the air compressor can work loose during shipping. We love this pitching machine. It is easy to transport and set-up. We love not having to tote and use a generator. This allows us to put the machine at pitcher's mound so that my son can practice batting at the plate. We have used it for batting and fielding, and his ability to catch fly-balls has quickly improved. We plug it in when we are done, and it's ready for the next session. We've only used it with baseballs and pitches vary which is realistic and requires judgement when batting. This was money well spent. Ordering from this company was very easy. Can't say enough about the positive customer service. It got here right on time. Works well and even exceeds rated speed (based on sensors anyway). Well designed. We have been putting it through its paces. Still early but battery life seems good for at least 550 pitches at 80% setting. If it is durable, it is an extremely impressive unit that was well thought out by someone who cared about making a useful product. This is a good place to buy a pitching machine. They know their stuff and are very helpful in picking a machine!